This summer, more than 250 DC kids are participating in DC SCORES’ three free soccer and enrichment camps. Throughout the season, we will highlight particular participants through our Faces of Summer SCORES video and blog series. You can also follow along on Twitter and Instagram via the hashtag #SummerSCORES. It’s summer — the pools are open, parks are filled with loungers and live performances, and a great number of students are on vacation. For many, this time of year is accompanied by feelings of excitement and opportunity, while others are burdened with the worries of how one will pass the days. For Bryan, a student at Thomson Elementary School, freedom from the responsibilities of school is a deep concern. He recognizes that being away from his studies can be detrimental to skills such as math and reading. He asks his mother to assign him math problems to avoid any learning loss. While tackling this issue, he understands that this does not answer the question of what he will do to avoid boredom. Boredom is the biggest culprit in unhealthy decision-making, especially during the summer months. As an active student and athlete, long periods of free time is not enjoyable for Bryan. That’s where DC SCORES’ free summer camps, which began at Kelly Miller last week, come in. Bryan’s love for SCORES summer camp is a combination of spending time on the field with teammates, and productively fill his free time. Bryan has been with DC SCORES for two years now, and his affinity for camp is apparent in his glowing smile. He thrives in environments that are geared toward being active and learning. His wholehearted engagement in the drills and games leads his coaches to describe him as passionate and hardworking. “Watching Bryan on the field is truly a joy," said camp coach Bashir. "You can be certain that he will do his best every day and be as excited as he was his first day of camp on the last day." One word that best describes Bryan is passion. It takes one conversation with him to see this. Whether discussing soccer, school, or NBA basketball, Bryan’s eyes light up and his scope of knowledge and pure interest permits him to talk for hours. Fair warning, this passion is highly contagious and may cause those who experience it to enthusiastically engage in conversations previously ignored. 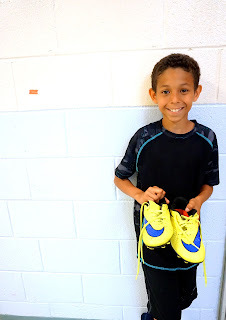 DC SCORES camps are more than just a place to have fun with friends and dodge boredom; it is an outlet for Bryan, a place to express his passion for soccer and learning to its full extent. Bryan’s goal of making summer 2016 one of memories, learning, and engagement can be a source of inspiration for many. With SCORES, summer will continue to be a time of excitement and opportunity for Bryan as he spends his days doing what he loves. Students have passions that should be encouraged and developed, but summer can often cause those passions to suffer. Thanks to SCORES supporters, this will not be the story for students like Bryan.